Green beans can be grown as a bush variety that reaches a height of 12 to 18 inches or a pole bean that grows to 8 feet or more in height. Many home gardeners prefer pole beans for their enhanced flavor and because they produce beans over a long period, supplying fresh beans for several weeks during the summer. These rapid climbers require staking or trellising for support. Although any sturdy structure will do, the tepee trellis is preferred as it requires relatively little space and provides and attractive garden feature. Trace a 4-foot-diameter circle in the soil with a hoe or rake. Mark eight evenly spaced points along the outer edge of the circle. Purchase or cut 8 8-foot poles. Poles that are 2 inches in diameter provide enough support for pole beans. Sink the end of the poles 8 inches into the soil angled slightly inward so that the top of the poles connect to form a tepee. Secure the tops of the poles with rope or plastic ties to hold in place. Firm the soil down around the base of the poles to anchor securely. Create a 6-inch mound of soil around the base of each pole and plant 4-6 beans evenly spaced around each pole. Cover with two inches of soil and firm down with your hands. Water thoroughly. Keep the soil moist, but do not saturate, until the beans germinate. Beans sprout quickly in warm soil and should be visible within a week. 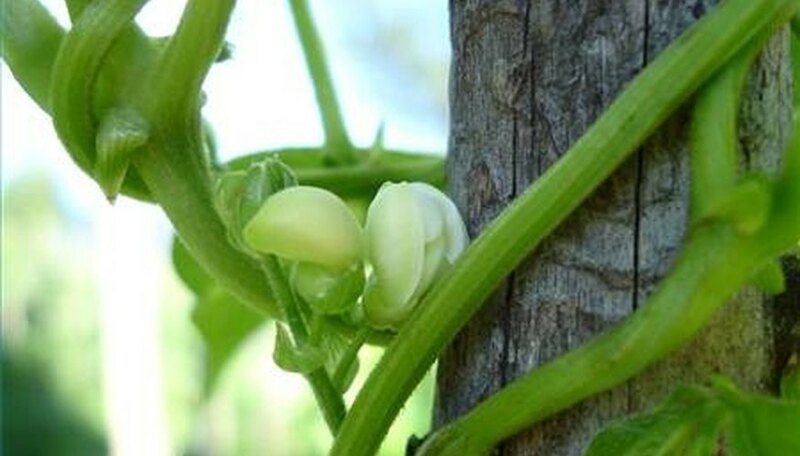 Train bean vines to climb the pole by wrapping them around the base, if necessary. Pole beans require very little training and generally climb the pole with no assistance needed.